Raghavendra Swamy is by far one of the most popular Madhwa saints. He is also perhaps the most well-known Madhwa seer but also the world over. Over the years, there has been growing interest in Raghavendra Swamy his works, life and times and the many mathas or temples dedicated to Raghavendra Swamy. Almost every aspect of the life and times of Raghavendra Swamy has been so well documented that there is very little left of him that we do not know. Yet, Rayaru is such a magnanimous person and the depth of his knowledge and philosophy is so deep that we get nee facts about the seer of Mantralaya and each passing day seems to bring in a new facet of his personality. Though there is growing interest about Rayaru, there are still many things that are yet to become popular. One such aspect is the places where Rayaru spent time. Though we are all familiar with Bhuvanagiri, where he was born: Bichale where he spent thirteen years in the house of his close devotee Appanacharya and Mantralaya where he entered Brindavana in 1671, there are many other places which are not as popular among visitors and pilgrims as these three places. One such place is Srimushnam, one of the ten most holy Vaishnava shrines in the world. If Ayodhya is known as the birth place of Lord Rama and Mathura is associated with Krishna, Srimushnam is the revered Varaha Kshetra or the abode of Lord Vishnu or Hari. Apart from being home to the Varaha Swamy temple, Srimushnam has another distinction which many are not aware of. It is here that Raghavendra Swamy is supposed to have spent close to twelve years. A staunch Madhwa, Raghavendra worshipped the Varaha diety here and stayed in a house. This was much before he entered Bichale in Karnataka sometime in 1658. Rayaru was born in Bhuvanagiri which is just a few kilometers from Chidambaram in Tamil Nadu. Srimushnam too is near Chidambaram and Rayaru spent much of his formative years in the Mudarai- Kumbakonam-Thanjavur, Srirangam-Srimushnam belt for several years. If he learnt Vedas, Shastras and other religious texts at Madurai, he took Deekshe at Thanjavur, joined the Sri Matha of Vijendra Theerta at Kumbakonam and spent years meditating at Srimushnam and worshipping Hari. Rayaru stayed for years at a house in Srimushnam and this house can still be seen. The Nanjangud Mantralaya Matha, or the Sri Raghavenmdra Matha, took over the house in 2010 and constructed a temple dedicated to Raghavendra Swamy here. The Nanjangud Raghavendra Swamy Matha is the official matha of Raghavendra Swamy and its name stems from the holy city of Nanjangud near Mysore which has a Rayaru temple where there is an exquisite idol of Raghavendra Swamy. Since many seers of the Matha spent time here, the samshtahan came to be called as Nanjangud Mantralaya Matha. 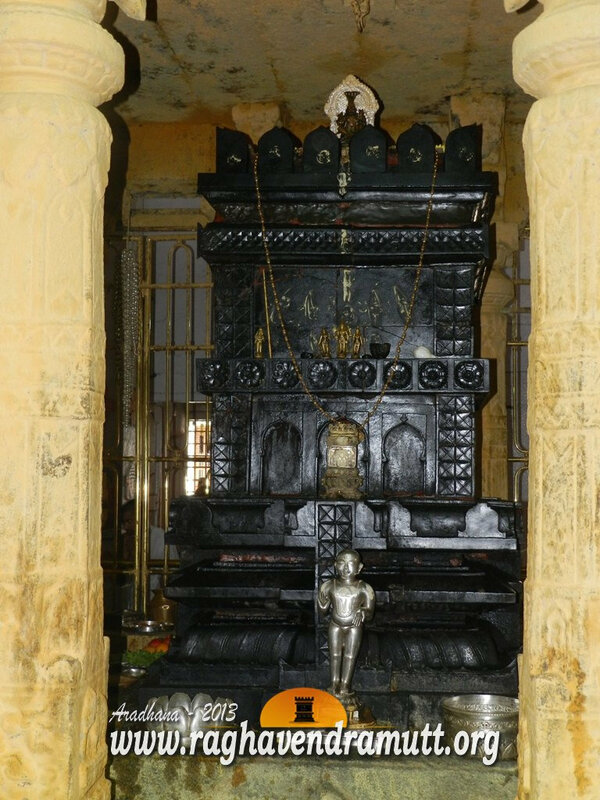 The then seer of the Raghavendra Swamy Matha, Sushameendra Theertha, had wanted to develop a Raghavendra Swamy Matha at Srimushnam so that devotees and pilgrims can get accommodation and Theertha Prasada. He wanted to provide overnight accommodation to people. He also wanted to renovate the house where Rayaru had lived. His successor, Suyateendra Teertha Swamy, brought this idea into action. On November 24, 2010, he performed the Pratishtapana of Sri Rayaru and Sri Mukhyaprana in the premises of the old Rayara Mane or the home of Rayaru. Incidentally, the stone for constructing the Brindavana was taken from the same segment in Madhavara, where the stone for the Moola Brindavana at Mantralaya was brought. It was Rayaru himself who had asked Dewan Venkanna to construct his Brindavana from the rock at Madhavara, which is near Mantralaya. This makes the Brindavana of Raghavendra Swamy at Srimushnam the only other Brindavana apart from Mantralaya to be sculpted from the same stone. Today, the house of Rayaru in Srimushnam has been transformed into a temple of Rayaru. The Mantralaya Matha maintains the home and matha and provides several facilities for pilgrims and devotees. Another interesting fact about Srimushnam for Madhwas is that Madhwacharya spent time during a Chaturmasa here and he gave some excellent discourses on Vishnu Purana, Bhagavath Geetha and other topics. Srimushnam is today one of the foremost pilgrim centres for Vaishnavas. It is among the few places where we can see Varaha with his consort Bhoo Devi. It is also the place sanctified by Madhwacharya and Raghavendra Swamy. This is also the place where Vyasa Raja or Vyasa Theertha and his guru, Sripadaraja, spent time as did Raghuttoma Theerta of Tirukoilur. Incidentally, the Nanjangud Mantralaya matha has drawn up ambitious plans to develop the matha into a centre of learning. It wants to expand the matha activities further so as to spread the Dwaitha tenet. It also plans to start a VedicSchool and a research centre. As of now, the newly established Matha provides transit accommodation, Teertha Prasada (lunch) and other basic amenities for pilgrims.